Home / Peter O'Neill / POWI / SHP / Southern Highlands / THOMAS ELUH / ELUH AS S.H. PROVINCIAL ADMINISTRATOR? ELUH AS S.H. PROVINCIAL ADMINISTRATOR? The appointment of former Assistant Commissioner of Police, Thomas Eluh, as the Acting Provincial Administrator of Southern Highlands Province will not go down well with many of us who have been following him closely in his commitment to combat corruption as a police officer. He was appointed by the National Executive Council on 2nd November 2017. The NEC decision comes a week after Mr Eluh’s court challenge against his dismissal from the police force was handed down. Although the National Court Invalidated Police Commissioner Gari Baki’s decision to dismiss Mr Eluh from the Force, the Court refused to reinstate Mr Eluh –which effectively puts Eluh on the street as an ordinary person. When I heard the NEC decision news, the first thing that came to mind was –Eluh has now been compromised, just like many others. Instead of taking my judgmental rant to social media, as usual, I decided to do some background check on Eluh. You have to know the person and the facts before making quick judgements. 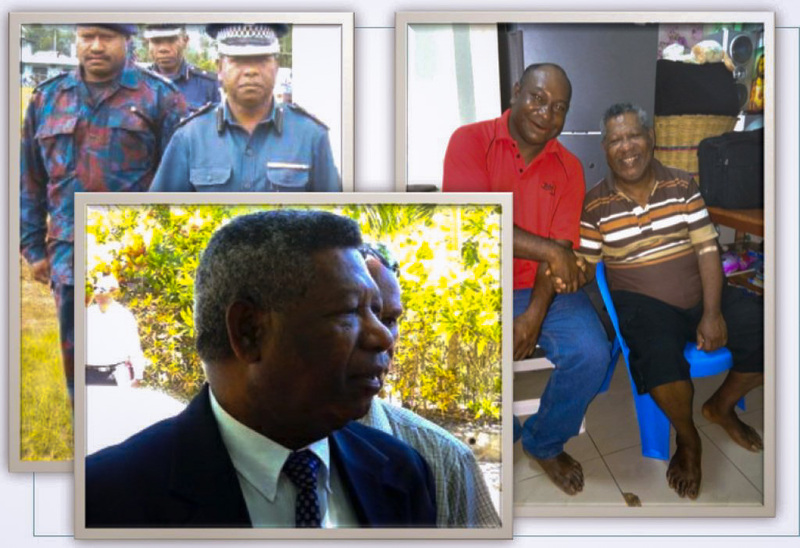 Mr Eluh is a decorated police officer with an unblemished record for over 40 years. He has prosecutions and CID backgrounds – no ordinary cop! He also got a diploma in Prosecutions. He was the one who prosecuted Prime Minister Peter O’Neill concerning the NPF saga. He was the one who served the arrest warrant on Prime Minister O’Neill on 16 June 2014 in relation to the ongoing Paraka Lawyers saga. He was the one who arrested and charged the Chief Justice, Sir Salamo Injia pertaining to the deceased estate of late Justice Hinchliffe during the political impasse period between 2011/2012. He was the one who arrested and charged former Prime Minister Bill Skate concerning some fraud at NCDC. So Thomas Eluh is no ordinary cop. He’s got the guts to do his job, even risking his own job. Eluh is well respected within the constabulary and viewed by many to be the next Commissioner of Police who could restore the constabulary to its glory days. Since 20th June 2014, only 4 days after he served the arrest warrant on PM O’Neill, Thomas Eluh was removed from his post as the ACP Crimes. Until two weeks ago, he has been on the sidelines of the constabulary. His skills and expertise were never utilized during this period, suffice to give moral support to Mr Matthew Damaru, Timothy Gitua and the National Fraud Squad team to continue with the PM’s arrest warrant case. Considering Mr Eluh’s history with PM O’Neill, he will be the first person on PM’s list to eliminate as a threat and last person to be rewarded. When the court refused to reinstate Eluh, Eluh was effectively out of the Police Force and had no leverage to bargain for anything. PM would have seized the opportunity to get rid of Eluh for good or at the very least, appoint him to a place where it can be considered as punishment. Instead, appointing him as PA for SHP, where it really concerns PM personally, not only because it’s his backyard, but more so he lost a substantial portion of his assets?? This doesn’t seem like a punishment to me nor an assignment to take Eluh out of the picture. Eluh was out of the picture anyway when NEC appointed him. This has prompted me to collect some further insight to this issue. The protracted counting period over the Provincial Seat of SHP has caused substantial disorder, disharmony and destruction to the province. The discontentment over the declaration has flared into the destruction of properties, loss of lives, the shutdown of vital government services and the situation is still tense up there. The Government decided to announce a call-out but as usual, Police Commissioner Gari Baki still complaining about K3 million to go up there so he can blow it up on hire cars with his cohorts. Even a Call-out cannot restore administrative issues. The Governor and previous Acting PA are taking refuge in Port Moresby and had never been up there since. It is believed that the NEC was compelled to announce the State of Emergency. However, since SHP was the only province that had SoE’s so far, PM was reluctant to establish one but was inclined to appoint a very strong PA to take charge. It is believed Governor William Powi had a nominee for the PA for SHP but PM strongly objected to the nominee. Instead, PM was searching for a person with military or police background who could take strong command and restore normalcy. Geoffrey Vaki who took the fall for the PM is a likely candidate, as he is currently on the streets doing nothing. For some reasons, when PM and NEC became aware that Mr Eluh has now been discharged from the Police Force as a consequence of the Court ruling, they made the decision to send him to SHP to restore normalcy as Acting PA.
WILL THE APPOINTMENT OF ELUH COMPROMISE PM’S CASE? Eluh is out of the Police Force. The Supreme Court has heard the challenge to the validity of the PM’s arrest warrant case hence Eluh is in no position to influence the outcome. After the outcome of the Supreme Court decision, it will be up to Police Commissioner Gari Baki to decide. One might argue that Eluh might still be around to do something but I see diminished chances of official involvement. SHOULD ELUH REMAIN ON THE STREET JUST BECAUSE HE HATES CORRUPTION? This is the most unthinkable demand from many ungrateful Papua New Guineans who fail to consider the plight of individuals who are at the forefront of the fight against corruption. These are not anti-corruption robots –they are human beings who’ve got family and day to day needs. Think about how Elah's family had endured for the last three and half years that Eluh was out of the Police Force. Think about Eluh, though with the best of intentions, could not do anything to combat corruption in a real and meaningful way, because the power to do so was taken away from him. The more he remains outside, he will not be able to use his skills and knowledge to serve this country. If we wanna see good people do something about corruption, give them jobs to do. It doesn’t matter who appoints them because it depends on the individual to either be his political master’s stooge or watchdog. Sadly though, politics has blurred the line between administration and politics that it’s easy to infer all top appointments has got more to do with politics and less to do with merits. WAS ELUH COMPROMISED IN THE APPOINTMENT AS PA? I’m not privy to any suspicious information other than those publicly available so I cannot speculate. But one thing is for sure – PM appointed someone in Eluh, who is not is a best friend, but someone has trust will restore normalcy in SHP. Time will tell if PM was genuine with this appointment. I’m still convinced that Eluh is a man of impeccable standing and it would be very cheap for me to draw unnecessary conclusions on insufficient premises. SHOULD ELUH ACCEPT THE APPOINTMENT? The foregoing has led me to say YES. Having someone of his calibre will not only help restore order and administration in SHP but also gives Eluh a better appreciation of administration mattes so that if he, as a professional, can be able to manage other organizations, preferably back as Commissioner of Police, one day. Eluh is not growing any younger so let’s be mindful that he’s got limited time to give to the country. If he is willing, he should accept the appointment and get his hands once again dirty in doing work. He is a public servant and is at the disposal of the Government of the day to deploy him anywhere of their choice. It takes time to build good people up with the appropriate skill sets. Let’s not be quick to destroy and discourage them for we do not have many around.